~~ Add tomatoes and garlic to cookie sheet. Pour olive oil and a pinch of salt all over. 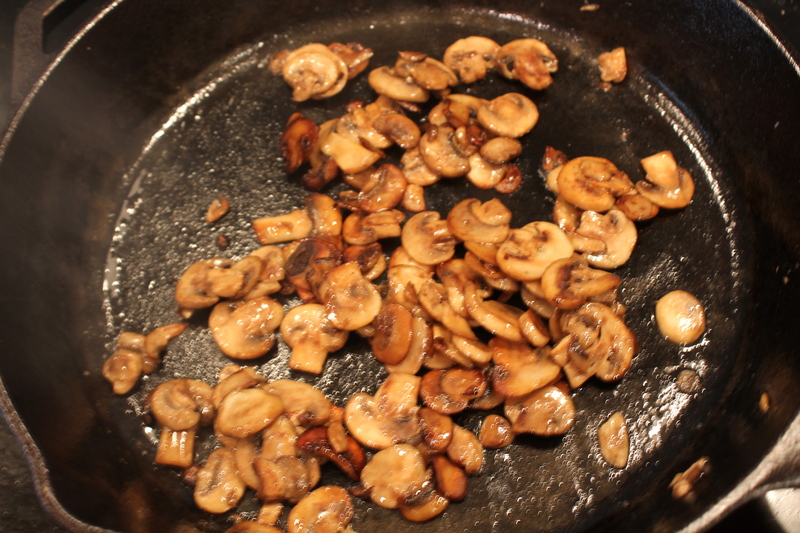 ~~ Add olive oil and butter to pan; add mushrooms and sauté. Then add Vermouth. 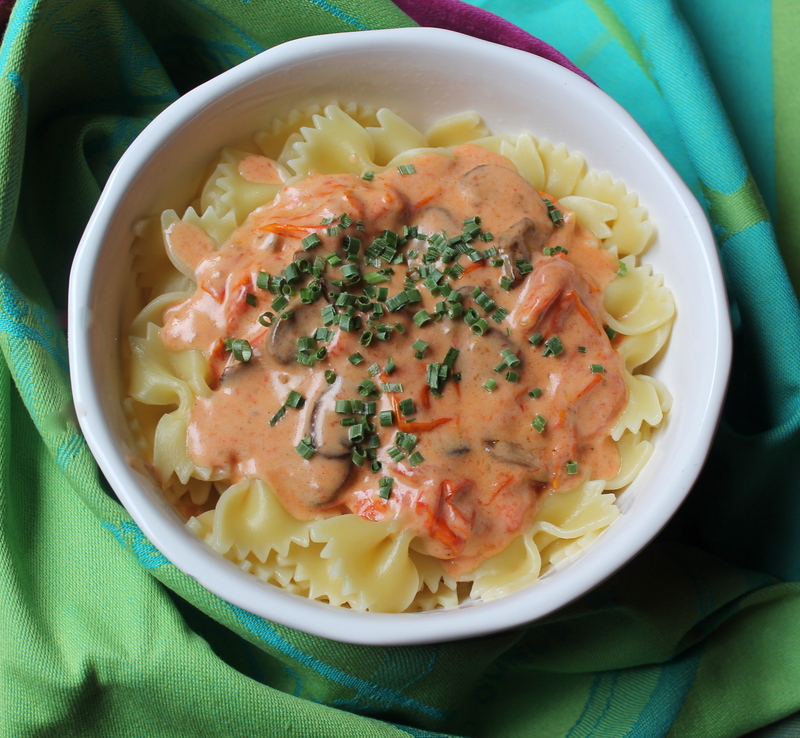 ~~ Add tomatoes/garlic and heavy cream to create the Pink Vermouth Sauce. Bring large pot of cold water to a boil and add Bowtie Pasta. Add olive oil and kosher salt just before adding the pasta and cook for 11 minutes. 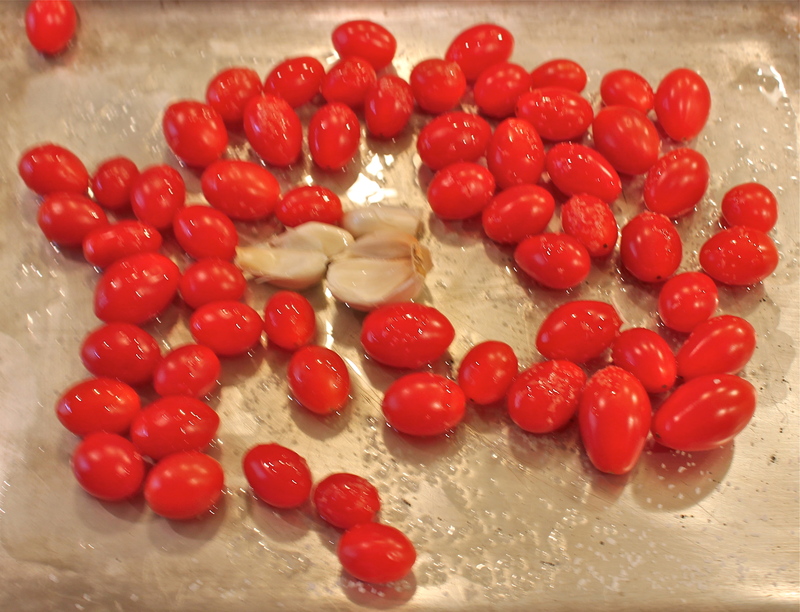 Spread grape tomatoes and garlic on a cookie sheet, and sprinkle kosher salt and generous amount of olive oil on top. Roast in oven for 15 minutes until both tomatoes and garlic are soft and mushy. Melt butter in cast- iron skillet, add olive oil; add mushrooms and sauté till they start to brown. Once browned, add 1/4 cup vermouth and cook for another couple of minutes. Move mushrooms to the side of the pan, and make a Roux. Add 1/2 cup Vermouth to roux and then blend in 3/4 cup of heavy cream. Mix till smooth and set aside off heat so sauce doesn’t separate. Remove tomato/garlic from oven and push the garlic out of the skins. Lightly smash the tomatoes with wooden spoon – add both to the sauce. Put back on the burner on medium to low heat and incorporate into the sauce. Mix well till sauce is heated through and is smooth. Sauce should be pink in color. Drain pasta and place in bowl. Add several spoonfuls of sauce and top with chopped chives. Thanks Barbara! What a good idea about Valentine’s Day! This is so different and gorgeous!! This looks delicious and so rich!! Thanks Sarah! I am fond of using Vermouth in sauces – gives a little tang to a sauce without overpowering it. That pink sauce looks delicious! Yum! Thank you – yes it is pretty tasty! I have been in such a pasta sauce rut lately, and I’m thrilled to find a recipe that’s delicious, pretty, *and* tasty. Also, a great way to use up extra vermouth! Yep – not too often I do the happy dance! Recipe doesn’t specify red or white vermouth, only “dry” vermouth? Which to use? Hi Wendy – Dry vermouth is the white one (which is what I use). Red vermouth is sweet vermouth. Sorry for any confusion.